Psoriasis usually occurs in early adult life, but the onset can be at any time from infancy to old age, when the appearance is often atypical. • There may be a family history—if one parent has psoriasis 16% of the children will have it, if both parents, the figure is 50%. • The onset can occur after any type of stress, including infection, trauma, or childbirth. • The lesions may first appear at sites of minor trauma— Koebner's phenomenon. • The lesions usually clear on exposure to the sun. 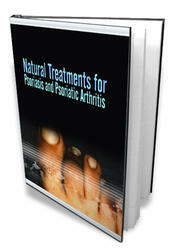 • Typically, psoriasis does not itch. • There may be associated arthropathy—affecting either the fingers and toes or a single large joint. Patients usually present with lesions on the elbows, knees, and scalp. The trunk may have plaques of variable size and which are sometimes annular. 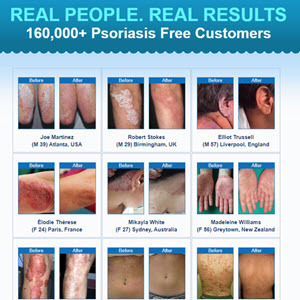 Patients with psoriasis show Koebner's phenomenon with lesions developing in areas of skin trauma such as scars or minor scratches. Normal everyday trauma such as handling heavy machinery may produce hyperkeratotic lesions on the palms. In the scalp there is scaling, sometimes producing very thick accretions. Erythema often extends beyond the hair margin. The nails show "pits" and also thickening with separation of the nail from the nail bed (oncholysis). 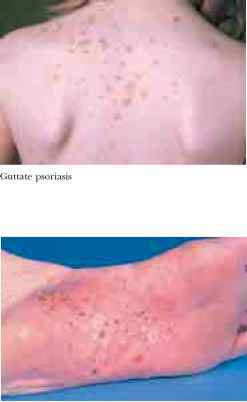 Guttate psoriasis—from the Latin g^tta, a drop—consists of widespread small pink macules that look like drops of paint. It usually occurs in adolescents and often follows an acute P haemolytic streptococcal infection. There may be much distress to both parent and child when a previously healthy adolescent erupts in spots. Fortunately it also resolves quite rapidly. 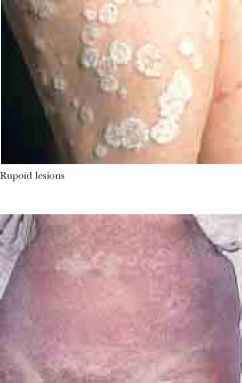 Pustular lesions occur as either chronic deep seated lesions or generalised pustular psoriasis. Chronic deep seated lesions occur on the palms and soles with surrounding erythema which develops a brown colour and scaling. It is important to reassure the patient that, despite their appearance, these pustules are not infectious—they consist of sterile collections of polymorphs. 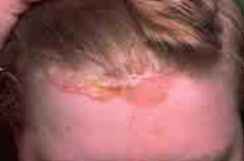 These lesions occur in an older age group than psoriasis, and psoriasis may not be present elsewhere. It is more common in smokers. Acrodermatitis pustulosa is a variant that occurs in a younger age group in which there are pustules and inflammation arround the nails and the fingertips. Generalised pustular psoriasis is uncommon. Pustules develop in association with erythema. It may be precipitated by the use of steroids. Nexuralpsoriasis produces well defined erythematous areas in the axillae and groins and beneath the breasts. Scaling is minimal or absent. It must be distinguished from a fungal infection and it is wise to send specimens for mycology if there is any doubt. Napkin psoriasis in children may present with typical psoriatic lesions or a more diffuse erythematous eruption with exudative rather than scaling lesions. Erythrodermic psoriasis is a serious, even life threatening, condition with erythema affecting nearly the whole of the skin. Diagnosis may not be easy as the characteristic scaling of psoriasis is absent, although this usually precedes the erythroderma. Less commonly the erythema develops suddenly without preceding lesions. 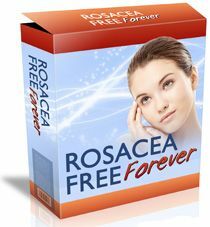 There is a considerable increase in cutaneous blood flow, heat loss, metabolism, and water loss. It is important to distinguish between the stable, chronic, plaque type of psoriasis, which is unlikely to develop exacerbations and responds to tar, dithranol, and ultraviolet treatment, and the more acute erythematous type, which is unstable and likely to spread rapidly. The use of tar, dithranol, or ultraviolet light can irritate the skin and will make it more widespread and inflamed. WHAT IS THE TYPICAL AND ATYPICAL PATIENT OF LUPUS?